» Articles » Trees » Can This Tree Be Saved? Can This Tree Be Saved? 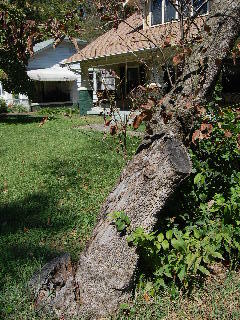 An aging friend stands patiently and nobly in the front yard; can (and should) your feeble old dogwood tree be revived? Perhaps you’ve lived in the same house for many years and grown and matured along with the landscaping; maybe you even designed the garden and installed many of the plants yourself when you first moved into the residence. Or, preferring a relaxed residential neighborhood to the newer more urban-oriented condo communities, maybe you’ve just moved to a lovely older home in an established neighborhood, feeling very fortunate to inherit a mature landscape already in place. Let’s look at the patient and see. 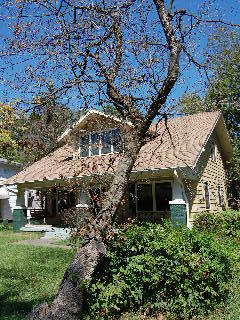 You know that your house was built more than sixty years ago, which makes it likely that the dogwood tree in question is sixty or more years old. Also, the base of the tree is 10 to 12 inches in diameter and the height of the tree is probably in excess of 25 feet, both measurements indicating a dogwood tree that has been growing for a very long time. But even more telling than your estimate of the approximate age of the tree is your observation of its physical condition. It doesn’t look good. More than half of the branching upright portion of the tree is already dead, having produced no leaves at all during this growing season. In addition to the absence of leaves, another test that confirms your diagnosis is performed by scratching, with your fingernail, the bark of the tree limbs in question. If the surface just under the outer bark layer is green and moist, the branch is still alive; if the underlying area is dry and hard, the limb is dead. Another indication of age and infirmity in this particular dogwood tree is that half of it has already been surgically removed by chainsaw (as indicated by a large “stub” at the base of the tree.) This causes the tree to be physically and aesthetically out of balance. In other words, it doesn’t look pretty in your garden. This hits at the heart of one of the primary reasons for landscaping the grounds of your home, anyway, and that is to add beauty to your property. Are there any short-term measures we can take to prolong the life of this tree? Not really. We could cut away the dead branches so that we don’t have the unproductive wood clinging to the tree and inviting disease. But cutting away this dead growth will only make the already out-of-balance tree look even worse. It sounds like its time to say “good-bye” to this great old friend that has given so much to the landscape for so many years. The tree should be cut off at ground level. If you choose, you may want the tree service company to also grind out the surface of the remaining stump. Or just leave the stump as is if it is sufficiently low enough to not interfere with lawn mowing. You may decide to plant something else in this same area. If so, just move a few feet away from the stump to avoid the remaining lateral roots of the dogwood tree. A Japanese maple would make a nice addition to your grounds, or as a tribute to your old friend who served so long and so well, you might decide to plant another flowering dogwood tree!